Since the ban of frictionless long pimples, the effect of slow pimples has been negated. 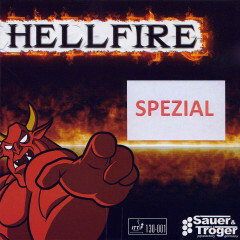 Produced by long pimple experts Sauer and Troger, Hellfire is slow and very dangerous and makes life absolute HELL for your opponents. The low speed means that heavy topspins can be returned with ease but more importantly with real effect and disturbance. Return serves with ease and in testing we were impressed at the spin reversal that could be achieved against heavy loop and topspin. Now you can be the one who controls spin and consequently controls the game. The versions with sponge are for classic defenders who play away from the table, the orthodox version is perfect for close to the table blocking / block chopping and controlling awkward play. Hellfire - at last, the revenge of the long pimple player -TRY IT! S + T Rubber Hellfire Spezial is beeing added to cart.